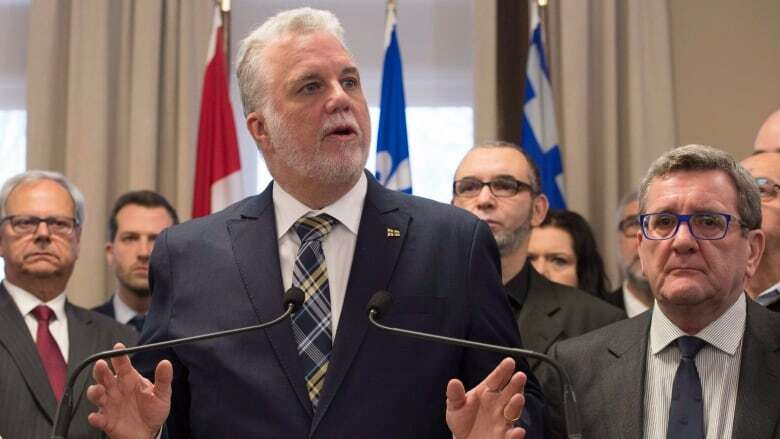 Quebec Premier Philippe Couillard stressed the importance of respectful political dialogue in the wake of the shooting at a Quebec City mosque that claimed the lives of six people. Quebec Premier Philippe Couillard stressed the importance of respectful dialogue in the wake of the shooting at a Quebec City mosque that claimed the lives of six people. "When I say that words matter, it means that words can hurt, words can be knives slashing at people's consciousness," he said Tuesday. Speaking to reporters, Couillard said it's easy to demonstrate solidarity following a tragedy. "The challenge is to do it one month, three months or a year from now, when an election campaign happens," he said, adding that the news media also has a role to play. Couillard urged politicians and the public to "think twice" about the "words we write, the words we utter." Couillard's comments are part of a soul searching underway within Quebec's political class and news media, where, critics say, years of harping on questions of identity and religious accommodation have helped breed a culture of intolerance. The attack happened Sunday, when a gunman stormed into the Centre Culturel Islamique de Québec (Islamic cultural centre of Quebec) during evening prayers. 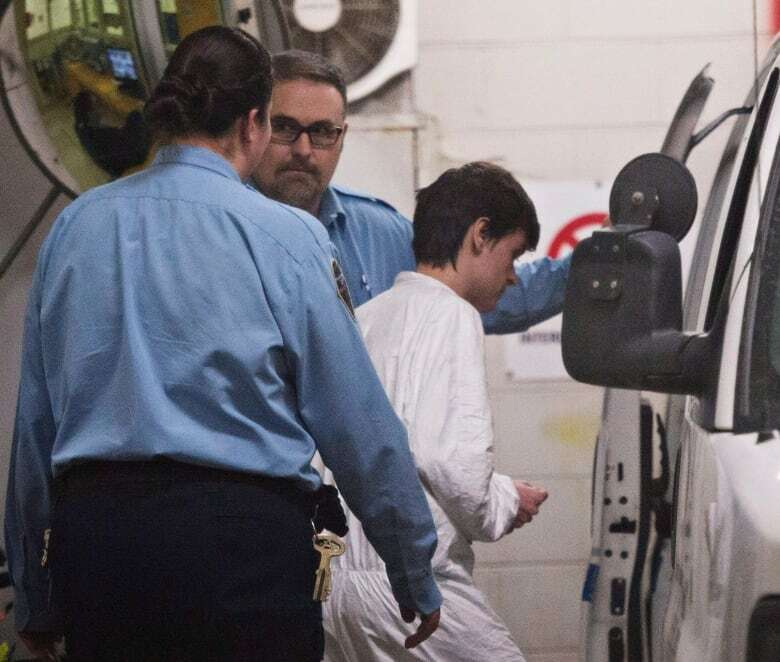 The man accused in the shooting, 27-year-old Alexandre Bissonnette, appears to have been drawn to the rhetoric of conservative politicians, including President Donald Trump and the French far-right politician Marine Le Pen. He was charged Monday with six counts of first-degree murder and five counts of attempted murder while using a restricted firearm. Earlier in the day, Parti Québécois Leader Jean-François Lisée acknowledged he had gone too far during his party's leadership race, when he suggested that an AK-47 could be hidden under a burka, a garment worn by some Muslim women. ​​"The rhetoric has to be toned down on every side of the debate," Lisée, who made identity politics a key focus of his leadership campaign, told CBC Montreal's Daybreak. "I used an example of a terrorist incident in Africa where it actually happened. Not a good choice of argument. It was not my best line. It was not a good argument to put in the Quebec debate." The Couillard government tried to legislate hate speech in 2015, following an uptick in hate crimes amid heated debate over the PQ's proposed secular charter. The premier abandoned the proposal, however, after the PQ raised concern it would restrict civil liberties. 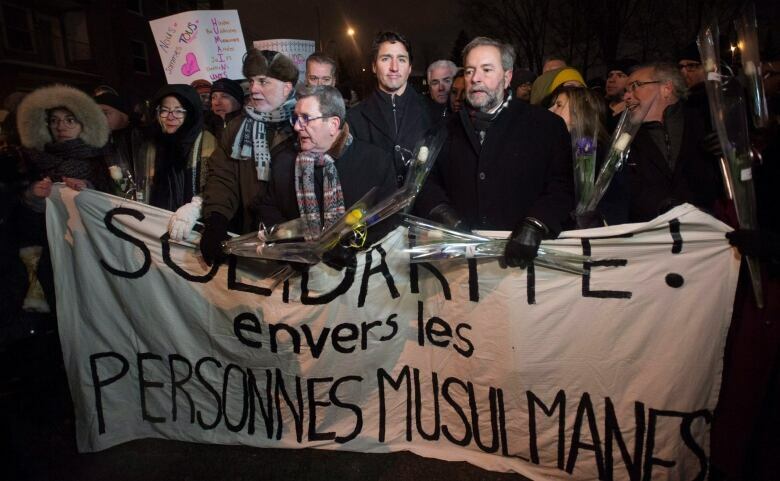 On Tuesday, he said his government has invested in Montreal's anti-radicalization centre in attempt to curb extremism. But he added that shootings such as the one at the mosque are difficult for authorities to prevent. "You can't follow step by step everybody in our society," he said. Éric Debroise, who met Bissonnette at a conservative discussion group at Quebec City's Laval University, said the alleged shooter often spoke admiringly of Trump and Le Pen. "He was not interested by our politics meeting because we are conservative and moderate right wing," Debroise told CBC news. "He is more far-right or alt-right. That's why he never came back to our politics meeting." Trump enjoys the support of the alt-right, a loosely defined political movement that includes white nationalists and white supremacists. Health officials said two of the 19 individuals wounded in the shooting remain in critical condition. Dr. Julien Clement, head of trauma at l'Enfant-Jésus hospital, gave an update Tuesday on the condition of the five wounded who had still been in hospital. Clement said one of the five has been released, while two are recovering well. The two still in critical condition are likely to survive but may have long-term damage, he added. They were expected to undergo surgery Tuesday. One of the victims sustained multiple bullet wounds. Another 14 people with minor injuries were released, according to a statement from the hospital, the CHU de Québec-Université Laval. Souleymane Bah, head of a group representing Quebec City's Guinean Muslim community, said there will likely be a joint ceremony for the six victims of last weekend's mosque shooting before separate funerals are held.